Carthage GUX Series of HDPE Uniaxial Geogrids for reinforcement of steepened slopes, vertical walls, foundations, liner support, etc. 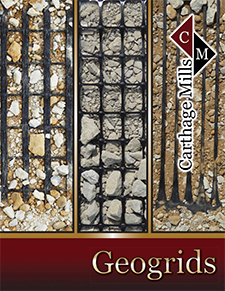 Carthage Mills' GUX Series Geogrids are manufactured using select grades of high-density polyethylene (HDPE) resins that are highly oriented and resist elongation (creep) when subjected to high tensile loads for long periods of time. Carthage GUX Series Geogrids, manufactured from HDPE, provide high resistance to installation damage and chemical or biological long-term degradation, and have shown no degradation in pH situations as high as 12 and can be used in both dry and wet-cast environments. Carthage Mills' GUX Series Geogrids come in two versions for two distinct Reinforcement applications: "S" for slopes, and "W" for walls. GUX Series Geogrids can carry high tensile loads applied in one direction (along the roll length for GUX-S and GUX-W). Their open aperture structure interlocks with fill material to provide superior load transfer from the soil to the geogrid. Carthage GUX Series Geogrids achieve their strength by punching and drawing a homogenous polymer sheet to provide a uniform, consistent product that does not require weaving, coating or welding to maintain the product's integrity. This unique process provides superior junction strength allowing high strength connections to other rolls of geogrid or facing components. Easy to handle and install, Carthage GUX Series Geogrids are used for high-strength soil reinforcement in wall and slope applications.